Thrilled to bring to you our next concert on 22nd June 2019 a packed programme of Brahms, Beethoven and Mozart. 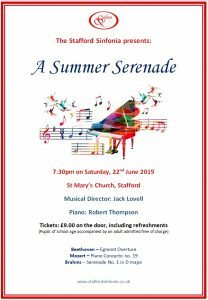 It will be a fabulous summer evening spent at St Mary’s Church in Stafford starting at 7.30pm. We are welcoming back the very talented Robert Thompson to play Mozart Piano Concerto No 19. What a treat. One not to miss on a glorious summer’s evening in a wonderful venue.